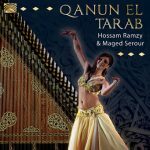 Having introduced many top quality albums for the Egyptian Dance, I am working on a new series to introduce each individual solo instrument we use in the Egyptian music ensembles as the star of each album, featuring a top class virtuoso in each one. Here, I am delighted to present to you Professor Maged Serour the top master of the Egyptian Kanoon in a unique collection of famous love songs arranged especially for the Egyptian Dance. So far in the series, a very successful introduction of the Quarter tone Accordion called “El Amar” featuring the great young star Accordionist Mohsen Allaam has been released by ARC Music ( EUCD 1589 ). The joy and pleasure in preparing the musical arrangements and recording of this album has been one of the exciting highs of my musical experiences. Maged Serour has been one of my closest friends and associates as well as recording with me since the early 90’s on almost all of my previous productions like the Best of Om Kolthoum, The Best of Abdul Halim Hafiz, The Best of Mohamed Abdel Wahab, The Best of Farid Al Atrash, Source Of Fire, Secrets of The Eye and Faddah. 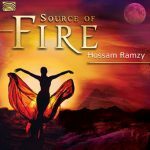 To write a review about this album and share your thoughts with other customers please click here Look at the bottom of the page to read the reviews about this album.